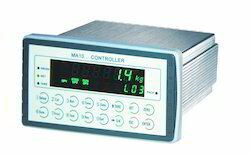 Offering you a complete choice of products which include batch controllers. Our company is recognized as a successful name of Batch Controllers in the market in the present scenario. The quality we give is unmatched. All the parts used are highly durable and suited for tough conditions. They consume more power for a given compaction effect than internal vibrators. The external vibrators are more often used for pre-casting of thin in-situ sections of such shape and thickness as cannot be compacted by internal vibrators. Looking for Batch Controllers ?